There's a TV ad I've been seeing where one stranger says to another, “Congratulations on your moment.” I like that line, and lately I've been hearing it in my head when I spot an amazing bird—especially when I'm alone. Don't worry, I'm not losing it. It's just a little celebration ritual—my way of savoring the moment when I find myself in exactly the right place at the right time. Most of my mornings began outside on the patio watching, listening and sipping coffee to stay warm. One day was by far the best, with 15 species of warblers spotted. My list included a Blackburnian, the flame-throated warbler that every birder longs to see each spring. Like a Baltimore oriole, indigo bunting or scarlet tanager, the Blackburnian warbler is one of those “wow” birds that can turn anybody into a committed birder. See one and you never forget it. And then you just want to see it again. Of course, many less dazzling birds are still coveted by those of us who practice this hobby. How else to explain my excitement over an orange-crowned warbler? It's a rather drably dressed species that can be tricky to identify; the “orange crown” is virtually invisible. I'd never positively seen this bird in my yard before, so when one came along and gave me a good close look, I was up to the challenge. Species No. 106 on my all-time yard list. Congratulations on your moment. 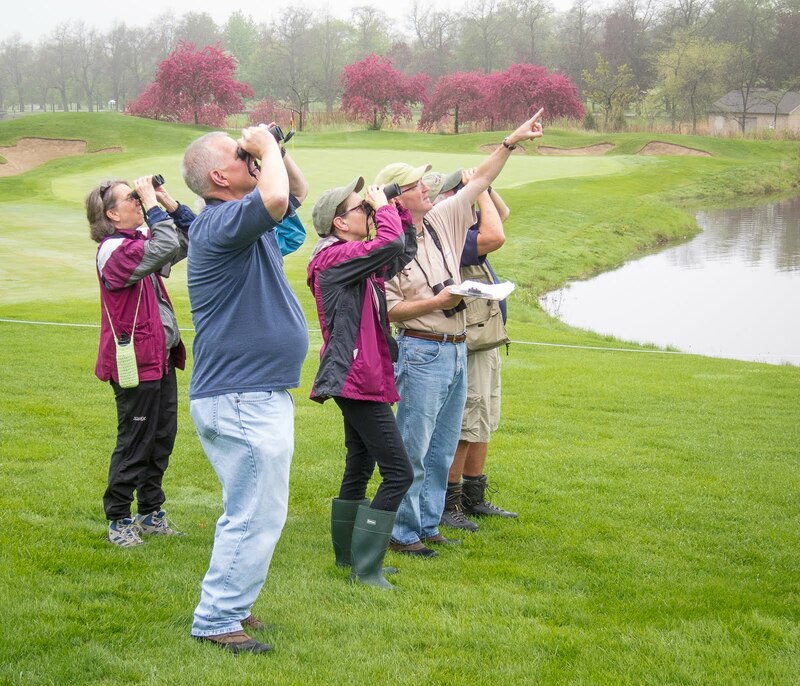 Several more memorable birding moments occurred on May 22 at the Elsen's Hill area of West DuPage Woods Forest Preserve in Winfield. It was a sparkling day—ideal for seeing a wide variety of warblers. That was not to be, but what I did find was even better. Almost from the time I stepped out of the car I could hear the flute-like sound of a wood thrush in the distance. It's a classic voice of the Eastern forest, and some would say it's the most beautiful bird song of all. Just listening was enough, but about an hour into my walk I realized the bird was quite close. Taking soft, gentle steps off the trail, I surprised myself by actually locating the singing thrush. It was perched on a branch about 20 feet up with it's back to me. What a treat it was to both see and hear this uncommon and declining species. Congratulations on your moment. But the best was yet to come. Soon I walked into a clearing and noticed a bird sitting on a dead limb. I knew by its profile and stillness that it must be a flycatcher of some kind. I moved a little closer and saw the clean white belly and dark flanks that gave the bird a vested look. Now, I'm thinking olive-sided flycatcher, which would be a terrific find. But I needed a better look, so I kept moving to get a different angle with the sun behind me. Fortunately, this bird wasn't timid. It held its position as I conducted a thorough study from head to tail. I saw white feather tufts on its back, confirming the ID, and then watched as the bird twice sallied out from its perch to snare a bumblebee. But my morning at Elsen's Hill wasn't finished. As I was enjoying the olive-sided flycatcher, I heard a loud birdsong coming from a scrubby area just off the trail. The source then revealed itself, flying across the trail to a tree next to the one with the flycatcher. When I saw the bold white eye ring my heart skipped a beat. Then the bird turned toward me, exposed in perfect light. It was a Connecticut warbler, a truly difficult species to observe in this region. Congratulations on your moment. Later, checking my log, I found that my only previous olive-sided flycatcher occurred at Indiana Dunes State Park in 1998. The Connecticut warbler also was a second-ever sighting, the first coming in 1999. My morning at Elsen's Hill was another reminder that birding is all about great moments, and that some of the best ones invariably happen when we're alone. Unless it's an ivory-billed woodpecker, I don't need a witness to enjoy a good find. But I do like hearing that voice.